The Frank Hawley Drag Racing School, led by the two-time NHRA Funny Car champion, has announced the co ntinuation of its relationship with the Mickey Thompson Tire Company, an organization built by an equally-important figure in racing history. Mickey Thompson Tires and the school first worked together in the mid-1990s when Hawley was based in Pomona, Calif., and has spent 20 years creating the top drag racing school in the world. Begun when Mickey Thompson Tires Vice President of Sales and Marketing Ken Warner joined forces with Hawley at Pomona, the partnership has evolved into a pairing that has seen incredible benefits for both sides. Kirk Fenn of the Mickey Thompson National Accounts Business Development Department, said the relationship has had incredible rewards for them. 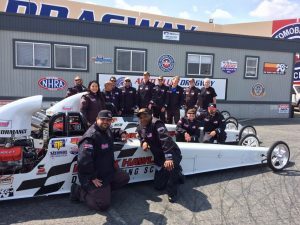 Hawley, an NHRA Nationals winner in both Funny Car and Top Fuel as the pilot of the legendary Chi-Town Hustler, said Mickey Thompson Tires has been an amazing partner for the school. The most successful display for the two entities has been the Mickey Thompson Dragster Adventure. 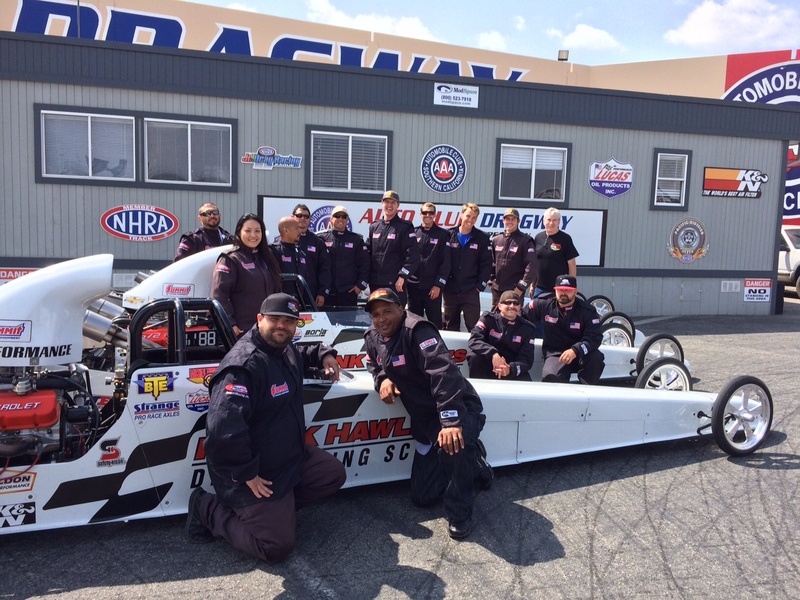 The program provides training at various drag strips across the country with the students racing in a Frank Hawley Drag Racing School dragster at the end of the day. The Adventure has seen some amazing highlights, from its most recent winner Floyd Carter at Fontana, Calif., April 21, to a group of Navy SEALs last spring. While working with the SEALs is an unforgettable experience for both parties, the primary goal for Mickey Thompson is to provide education to customers and staff. The company also has a sizable involv ement in off-road racing and provides an all-new experience to staff members who are unfamiliar with drag racing, although that’s not always the case. At the end of the day, success is measured in profit and the Frank Hawley Drag Racing School has definitely provided the opportunity for the Mickey Thompson Tire Company to expand both its reach and its customer loyalty. “It certainly provides more of a hands-on takeaway,” Fenn said. “The more familiar our customers, dealers, and the end users become with a product, the more receptive they are to talk about it and essentially, sell it. That tends to be a positive take away and going back to the Fontana event, we had customers there who have since ramped up there overall volume of Mickey Thompson product.